While we eaters are revelling in perfectly ripe canteloupe, watermelons, peaches, blueberries, sweet corn, tomatoes, cucumbers, …our growers are not only hefting literally tons of melons in a morning, but also steadily working on what’s going on our tables and in the pantry come the fall. Here are some photos from Picadilly and Riverland showing just that. Fall carrot beds are looking great at Riverland. These rows are planted straight and evenly spaced to allow for tractor work– keeps the rows relatively weed free and comes in handy later for loosening the rows for harvest. A tractor at Picadilly moves slowly along the bed, tines on the attached tool unearthing the carrots so that the crew can follow up and quickly gather and bunch them to be taken back to the wash barn. 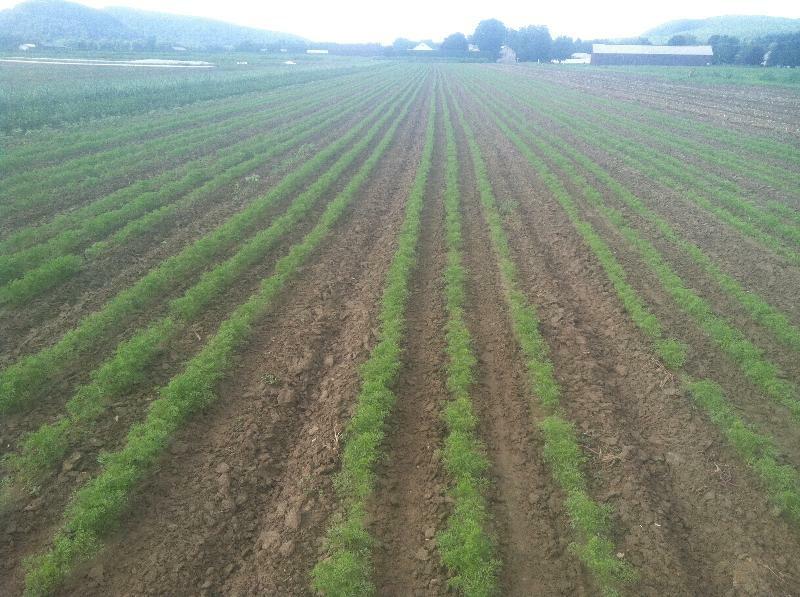 Picadilly likely has more than 10 row-miles of carrots planted at this point in the season. The early plantings supply both the summer shareholders’ weekly take, the later are enough to take Shared Harvest members through the winter. 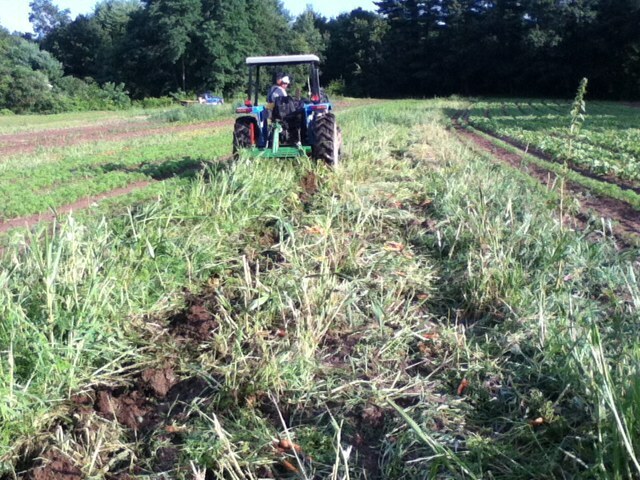 Picadilly’s soils are sandy-loam with very few rocks, which makes it easier to tractor-cultivate and grow healthy size carrots. A couple of weeks ago (thought you’d hardly know it now), was one of those crazy storms pouring buckets of water (3 inches in a morning) on the Pioneer Valley. 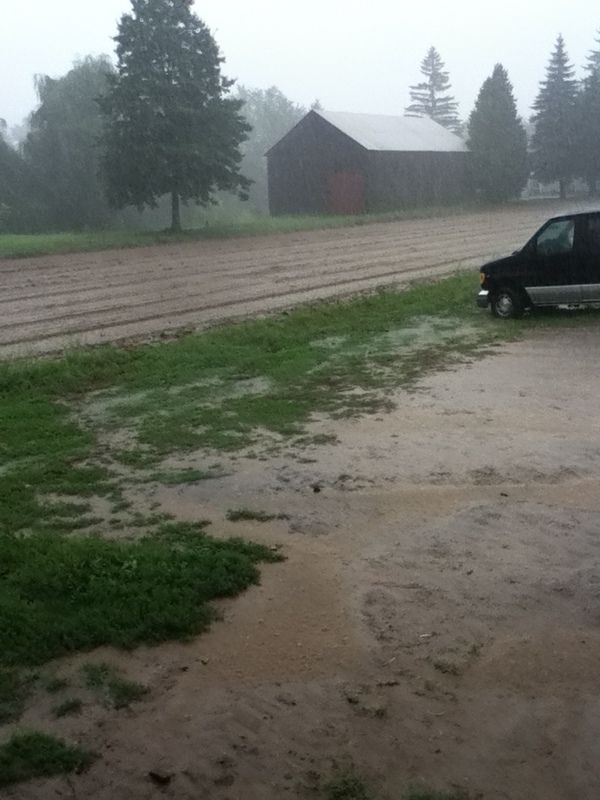 These storms seem to be becoming a regular part of our summers in New England and our soils and plants had better know how to take them. In the photo, here are some purple top turnip seedlings holding on steadily after the deluge that had puddled up the fields. 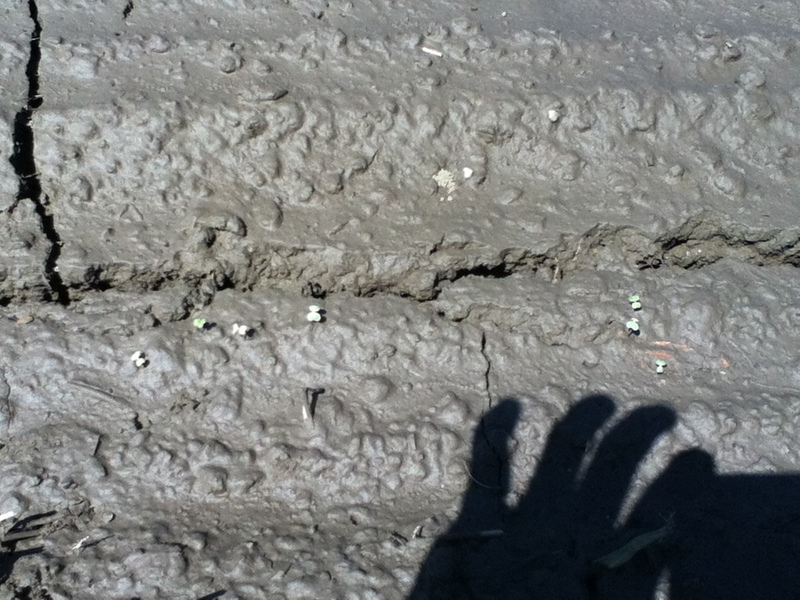 Fortunately, Riverland’s soils drain relatively well. 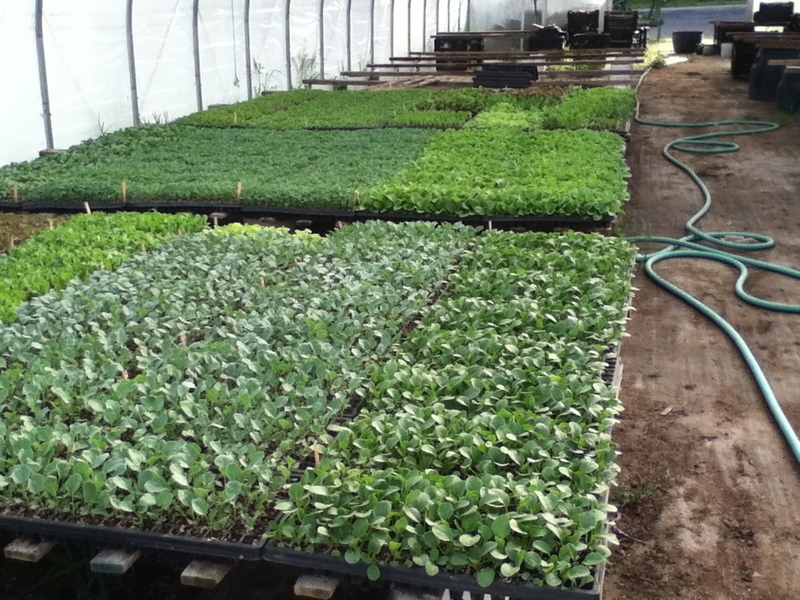 Here are yet another series of seedlings for fall greens at Picadilly, among the last to leave the greenhouse as transplants this year, hardy enough to grow outside well into the Fall. 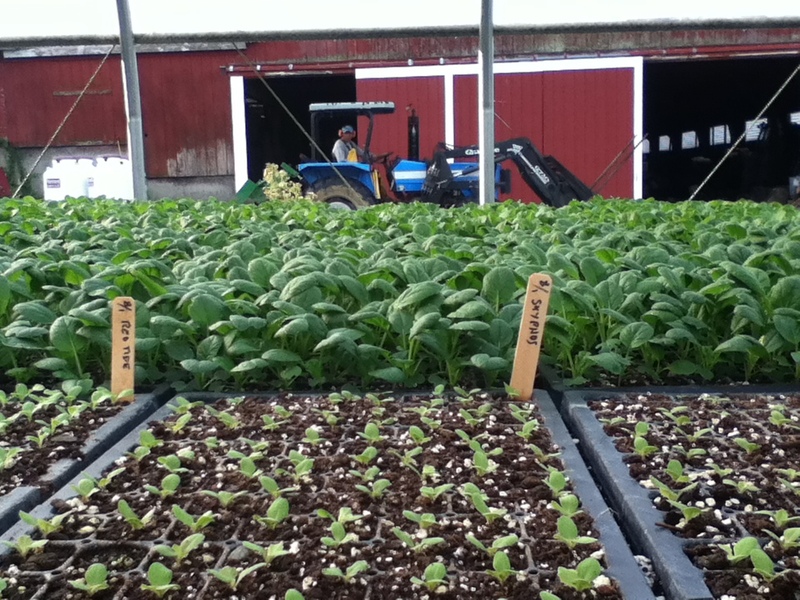 Some greens, like spinach, will soon be seeded either in the greenhouse (“high tunnel”) or seeded in the field and covered with “low tunnels” and harvested in the winter. They’ll grow as much as they can until the days get too short, and then they’ll be in a holding pattern, staying fresh in the soil until picked. 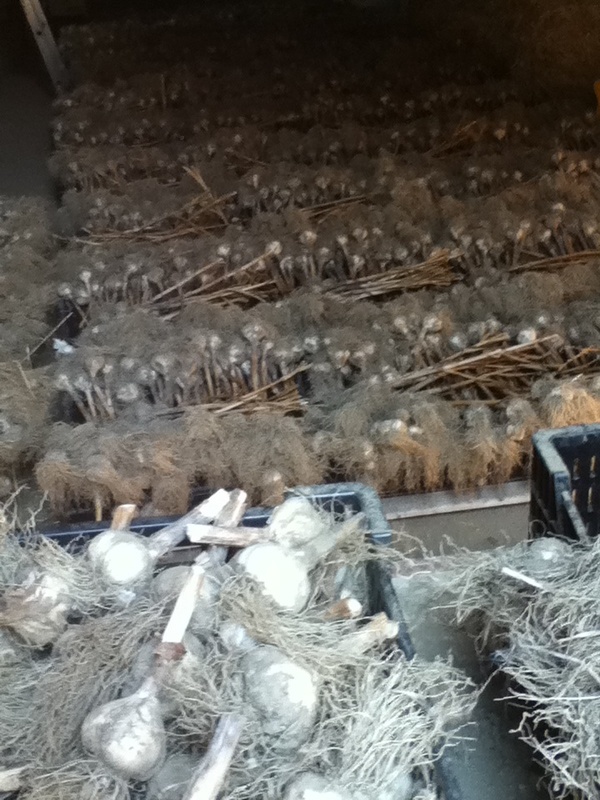 This year’s garlic was harvested over a month ago; then it was to laid out to dry and cure for a few weeks before being bunched, braided or stored. A good portion of healthy bulbs are set aside as “seed” for next year’s crop; their cloves will be planted in the ground this fall and mulched, much like any bulb-type garden plant. Rob and Meghan at Riverland report that the copious rain in June and early July was gobbled up happily by the garlic and they have their largest bulbs ever (and they’re quite tasty.). 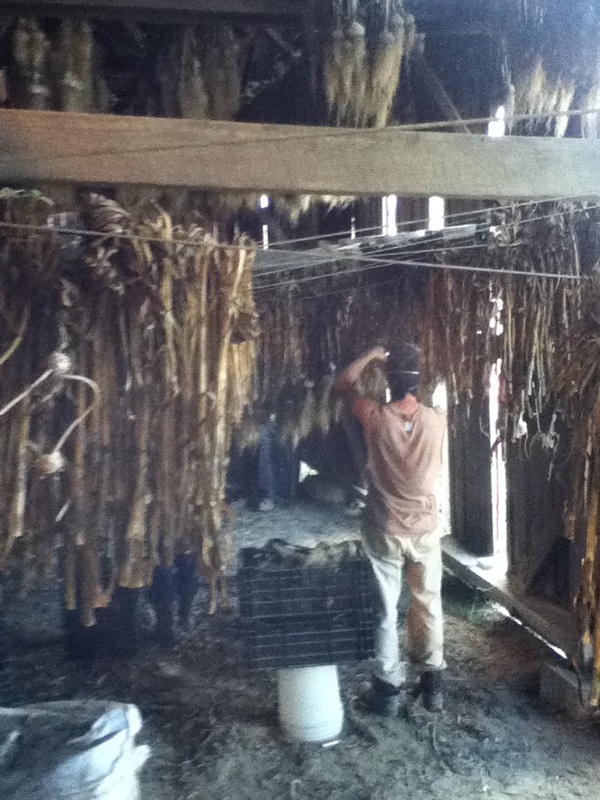 Riverland crew trimming garlic in the barn. Overhead storage can hold more garlic, but makes trimming a bit more of a shoulder workout.